All the babies being fed! This little rascal wanted to be in all th pictures! Bull Frogs! Check out those legs! Taking it slow and easy! I am so sorry about the quality of this picture! My camera was really struggling to find the bald eagle to focus on. He was way up in a pine tree and in order to see him you had to catch him just right between all the branches! This is a juvenile bald eagle who happened to take his final flying lessons on Saturday. Mama bald eagle came and toppled the nest shortly after he made a couple of flight runs! AMAZING! Susan at A Southern DayDreamer is our wonderful hostess! Head on over to her blog to catch a little more of the outdoors! Absolutely AMAZing photos!!!! That very first one….super. Love ’em all tho! 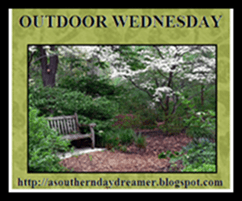 My Wordful/Outdoor Wednesday is all about something that was ‘taken from our yard’. But at our request. Happy Wednesday to you. Your wildlife pictures are amazing to look at. Absolutely awe inspiring photos! How were you able to get so close? What camera do you have? The eagle picture is amazing and you also were able to see the final flight, how great! AMAZING PHOTO! I just love the beaver and all are great! You made my day! Wonderful photos! Happy Outdoor Wednesday! What great photos! The beaver was my favorite! Fantastic and amazing captures.I loved each one. Nature is just amazing! You captured some incredible animal shots. I can’t believe that bald eagle. We have a few here at the lake, but we have never seen them. Wow! You hit the mother lode! Love the beaver!! The eagle is incredible too and witnessing the nest toppling! Spectacular! Thank you for sharing these images with us. The heron and the turtle are outstanding. What type of lens are you using? I loved the beaver and your perspective. Isnt it amazing that the mama eagle would topple the nest after the baby got the “hang” of it? LOL wouldnt we all be the smarter if after we have given our kids their wings we could close the doors of our home and MOVE!! ahhahhha. now that is what i call letting them live their own life. Thanks for sharing such divine experiences. BEAUTIFUL photos!!!!!! It must run in the family. I also loved A day in the park. Love your pictures. So nice to see all of these beautiful outdoor creatures. Thanks for posting!! I really enjoyed looking at them. REALLY amazing pictures. Thank you so much for sharing them. Those baby ducks are just adorable. I think you did an amazing job at capturing those photos. . .You must have a good camera. Thanks for sharing with us today! Isn’t it so amazing how animal parents know how to feed and raise thier babies. What a wonderful Creator to build this knowledge into them. Fantastic zoom lens and focus!!! I think you’re ready for a National Geographic assignment!! What fun pictures and what a great place to visit!